The Spray N Wash stain stick gets just about any stain out. Years ago, when my youngest was a baby - he was wearing an all white outfit. I was carrying him and a cold cup of coffee. As wiggly as toddlers are - he bumped the cup and some cold coffee spilled on his shoulder. We were away from home visiting friends so I wasn't planning on doing laundry for a few days. My friend let me borrow her Stain Stick - but I was doubtful that a coffee stain would come out of an all white cotton outfit. Well, when I got home I threw it in the wash, but I wasn't holding my breath. Imagine my surprise when the outfit came out looking just like new. 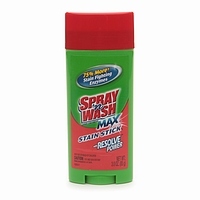 The Spray N Wash stain stick has become a staple in my laundry room. Thanks Neena for sharing your results with this laundry stain remover. I should note that one of the things that make this pretreater so popular is that you can pretreat a stain with it the same day you get the stain, for example, and then wait several days before laundering the item without fear that it will remove the dye from the fabric. That keeps the spot from setting in the mean time, without requiring you to do a load of laundry when it's not convenient. Does anyone else have a favorite laundry stain removal product for coffee or any other stains? If so, you can share your laundry stain removers review here, or see even more reviews already submitted. You can also read more about other coffee stain remover products here. Nikki has shared her review of the Spray And Wash Stain Stick, and why she thinks it is the best laundry stain remover. By far, the Spray n Wash Stain Stick is the best product I've tried thus far. The reason I originally purchased it was just to try it because it was on sale and I had a coupon. However, once I actually used it I was hooked! It looks like a very large tube of chapstick, with the Spray n Wash logo. The first thing that appealed to me about it was that you do not have to wash your clothes right away after you put it on a stain! Instead, you can rub this wax like tube on the stain, and leave it in the laundry for up to seven days! As I first purchased this in college, that was a huge relief and a big time saver! In addition, because it is a little stick, which is smaller than a bottle of spray laundry stain remover, it also saves space. I've never had a problem with it in terms of irritating my skin, or leaving any type of residue. As far as I can remember, it has always removed stains, except for dried paint (which I wouldn't expect it to). I was able to remove food stains, dirt, blood, you name it. My first tube lasted me for about one year. When I ran out I had to hunt for another tube, and found it surprisingly difficult to find! I finally found it at the local Stop and Shop Supermarket for $2.99. I love the convenience, small size, and how long it lasts. It has no scent, and I always hated how the sprays seemed to get on everything sometimes. The stick is much easier to control the amount of area you want to get at. I would recommend this to anyone! Thanks Nikki for your Spray And Wash Stain Stick review. I did not know this until recently, but apparently all Spray N Wash products are being re-branded to be Resolve stain removal products now, so if you have trouble finding it as Spray and Wash, look for Resolve laundry stain removal products and you will most likely find the same thing, just with a different name. So, does anyone else have a favorite laundry stain remover? If so, share your reviews here, telling me why you like, or don't like, a product (or read many other reviews already submitted). A reader has shared where you can find the new version of this product, which contains "Resolve" now. I've been looking for the Spray'n Wash Laundry Stick for months, and discovered it has been discontinued from this website. I found it today at Walmart.com. It is still called Spray'n Wash, but it has "Resolve power", whatever that is. I ordered 4 bottles at $2.48 plus .92 shipping each and will hope that it cleans just like the old formula. Thanks for sharing this LaundryMama. Once you give this new version a try I would love to know what you think about it. Many readers don't like the new version, but I always like to hear additional opinions about new formulations before I make up my mind. I would love to hear from others who have tried the newer version too, telling me how it worked for you, and what stains you got out (or tried to get out) with it. You can share your laundry stain removers review here for this or any other brand, or read other reviews already submitted. Plus you can read more reviews of the Resolve stain stick here. I used the original Spray and Wash Stain Stick which was formerly manufactured by Texize, then Dow Chemicals, for YEARS! This was the BEST stain remover but it was phenomenal for removing colors that faded on your clothing articles! Honestly, it totally removed faded on colors! The Resolve version doesn't do anything, nor does Oxiclean Gel!!! I AM SO DISAPPOINTED!!! why fix if not broken? This Resolve is terrible. Does not take out most stains. The stain stick with Spray N Wash was a miracle. Why fix it if it is not broken? Old spray n wash stain stick ROCKED! The new Resolve is a joke. I never use it now. Haven't found anything that works as well as the old stuff. :( End of review.